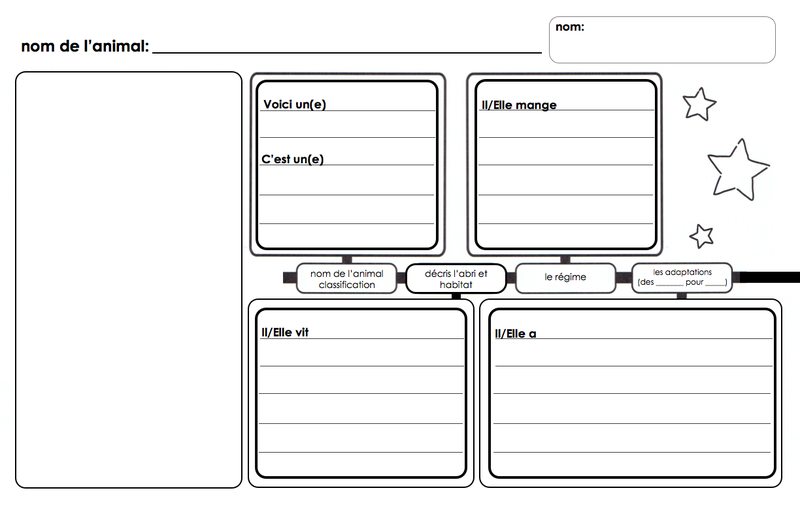 Just added the vocabulary materials for our next unit. We are going to try combining a Social Studies theme of changes in my community and a Science theme, plants and earth day. Why do things change over time? Have the changes in our community over time been good for our local environment/park/pond/lake? 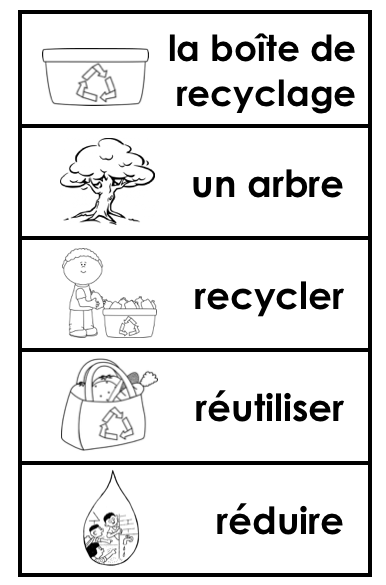 Word collections have 3 themes, spring, in the garden and earth day. I plan to introduce 1 a week. Find the folder to download files on my Google Drive here. Smaller strips are for students, in journals or agendas. Larger strips for pocket charts. 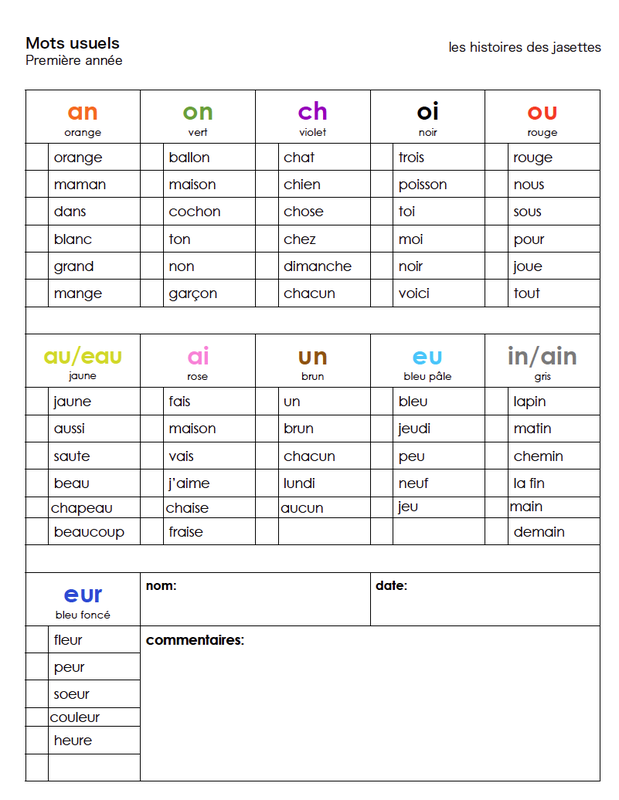 One file has only a few words with the sound blends in the words highlighted in colour and colour pictures. You may just want the black and white version as it includes all 30 words). Using the Pearson Many Voices resource as a starting point I divide the grade 1 Alberta Social Studies curriculum into 4 units of study (those that are in Many Voices). 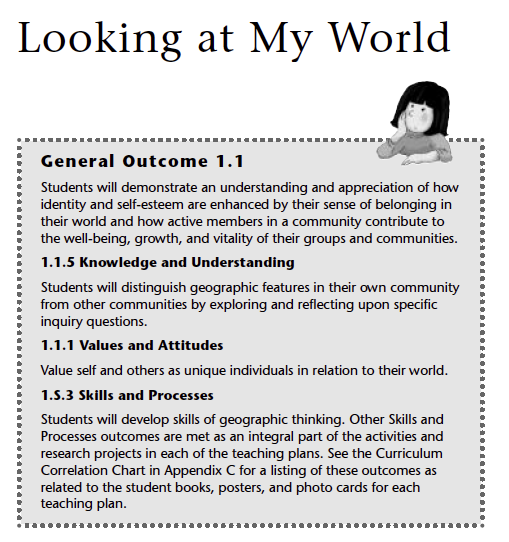 They are listed below with the outcomes as laid out in the Many Voices resource. The questions for inquiry for each unit are not included here. Our grade team addressed those in our more detailed unit plans. My grade team decided to focus on science curriculum themes first term and did not teach or report on social studies outcomes first term. 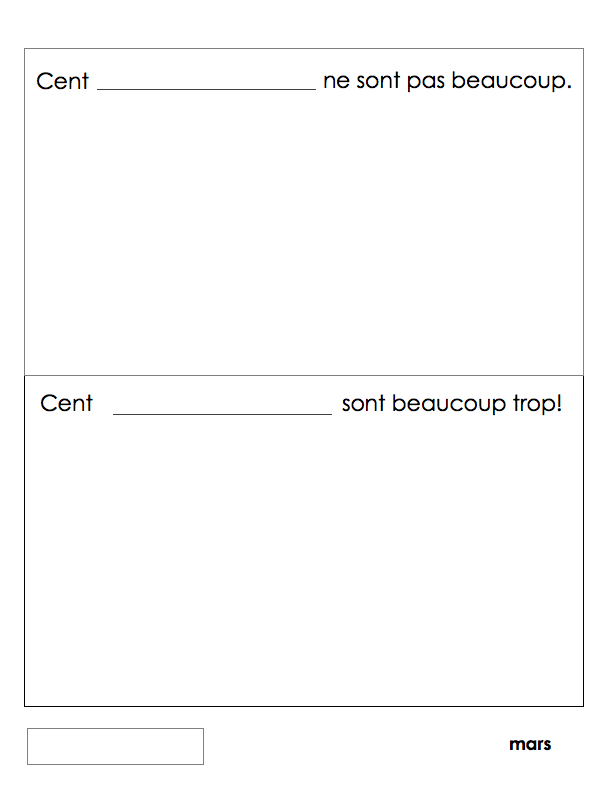 We found that in grade 1 in French Immersion students have very little language to discuss the more abstract concepts in the Social Studies curriculum. Therefore, you will see that these units began in January and are taught and assessed in terms 2 and 3 of the school year. Following these and the grade 1 science themes I divide the year up to follow these areas of study. Our writing, art, reading, and technology projects all have these themes at their root. So, when we learn new vocabulary or make a collaborative class book or a math journal I try to tie those learning experiences to these themes. I have not posted my unit plans for each unit, however the first unit can be found here. 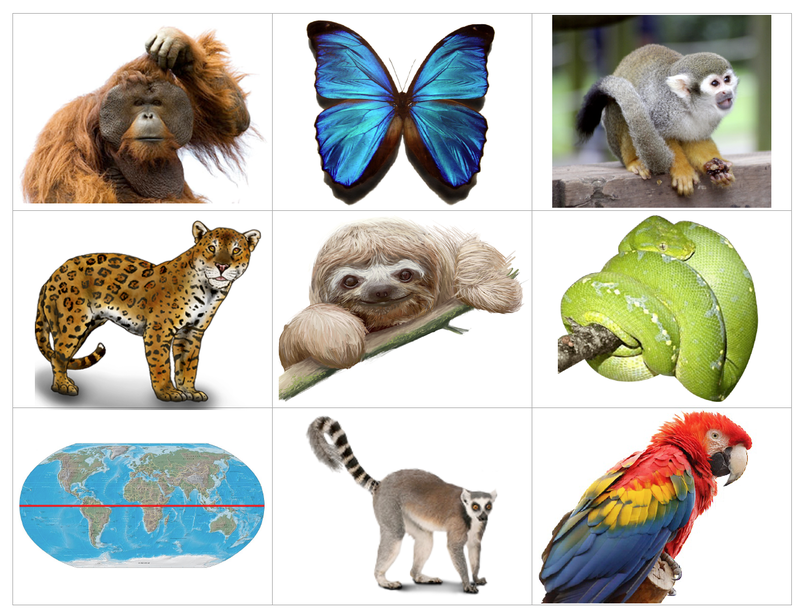 We did not make a collaborative book for this unit but in science we were studying animals and adaptations and made a collaborative book linked to that unit of study. It can be found here (examples below). Download documents here and here. This was a new inquiry project for our grade team based on artifacts from the past. We studied a class collection of artifacts and then compared them to present day objects meant for the same use. This book represents just the beginning of our final project. 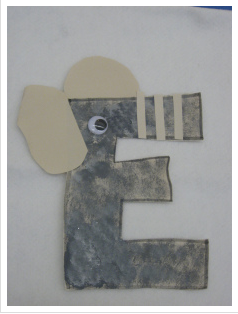 We took photos of the objects as well for students to include with their work. They completed a similar observation after a visit to The Calgary Heritage Park, taking photos at the park to record the object they were to study. I have some "How to draw monsters" books in my class that I have taken apart and laminated individual pages. We use those for inspiration for monsters. 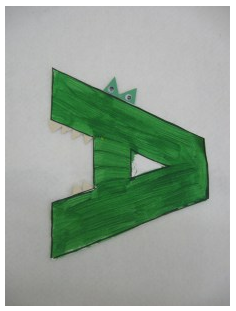 Sometimes the monsters are a more major art project, students can use different media and we photograph and describe them later in this kind of writing piece. See document here for some samples of 'learn to draw" ideas to print. 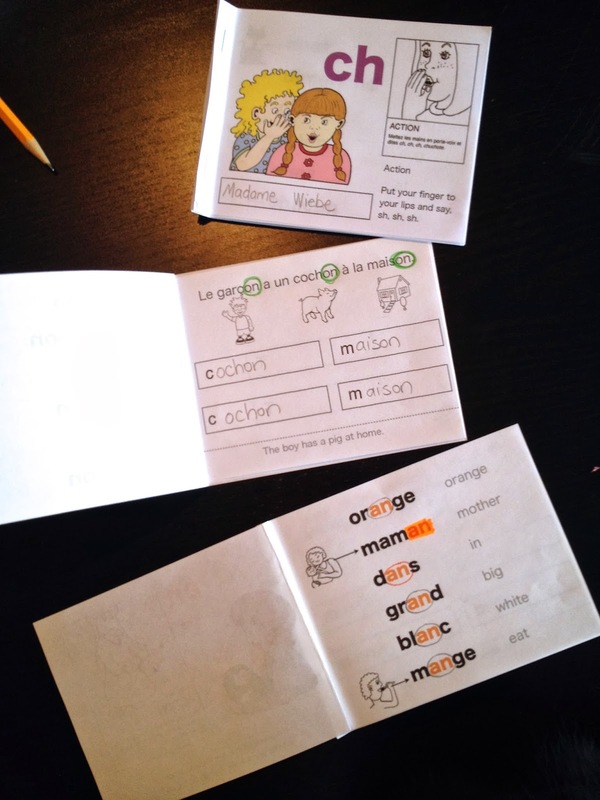 So, your 5 or 6 or 7 year old is heading to (or will be heading to) French immersion for the first time and you want to help them at home? Where to start? Here are a few ideas. 1. Learn some french songs. 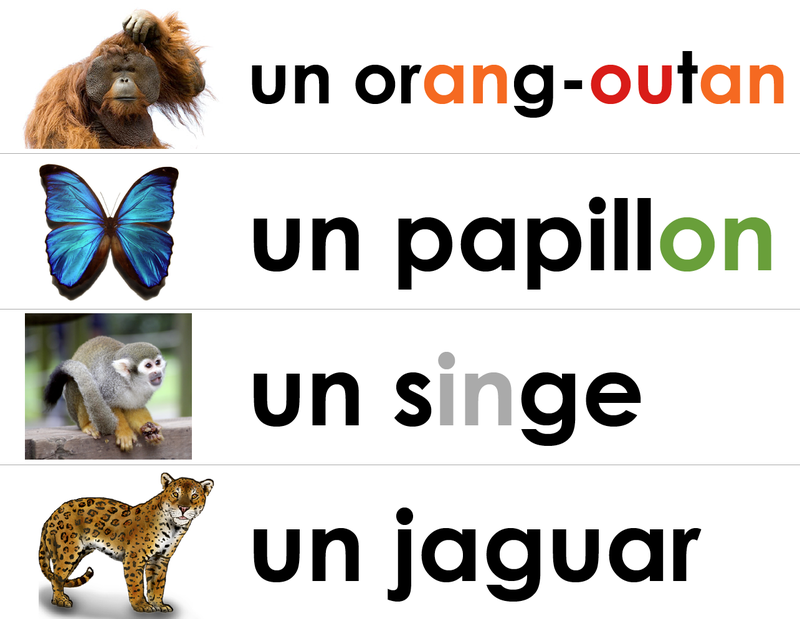 I'm going to suggest that you don't even have to translate them or tell your child, "Okay, now we're going to sing a song in French", just do it. When I have your child in class for the first time I sing everything, we sing a song to come to the carpet, to line up, to call out our class puppet, to clean up the toys. Initially the children just listen, enjoy the tune, and with some prompting and actions start to do what I do. With time they begin to understand some key words and may ask what the rest means. 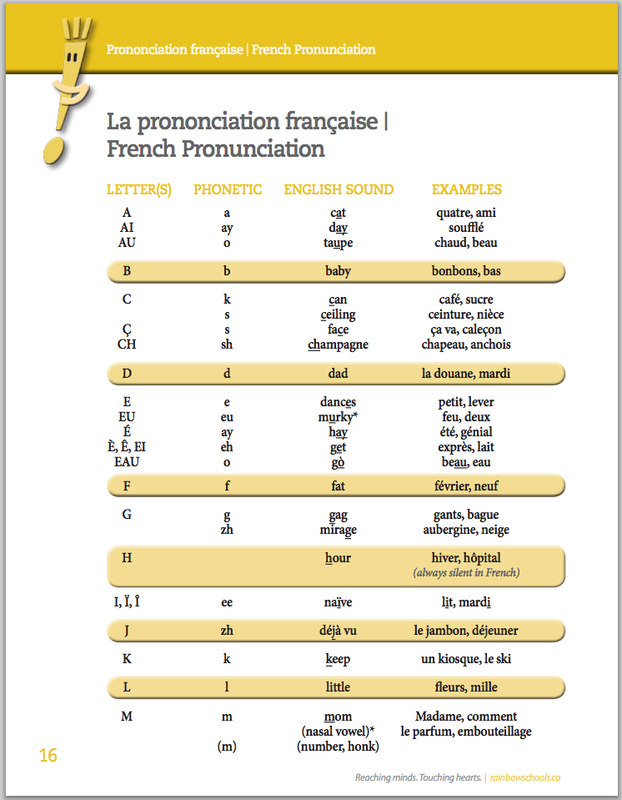 You can even start with some familiar English tunes using French words. My playlist of songs for grade 1 on YouTube. Here is one of the more popular playlists by Comptines, lyrics are highlighted as they are sung. 2. Colours, shapes, body parts, animals. This vocabulary is what we start with in my class. 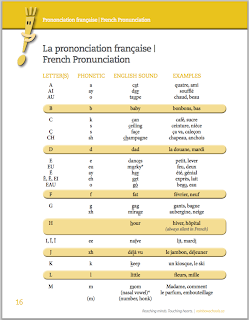 Grab a visual dictionary (I have some here and here for you), type the words you don't know how to pronounce into a text-to-speech tool like google translate and you're ready. 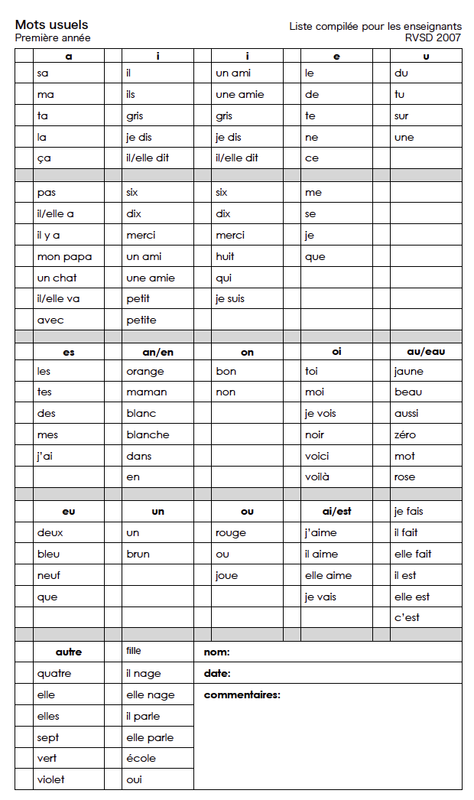 Again, I don't suggest telling your little one, "Now we're going to learn French" as you whip out your sheet. Keep it as authentic as possible. When getting dressed point to a colour on their clothing and proclaim, "C'est bleu." They might look at you quizzically, repeat blue, this is blue, c'est bleu. Do the same when you read books (even if they're in English), when you go on outings, or when you eat a snack. 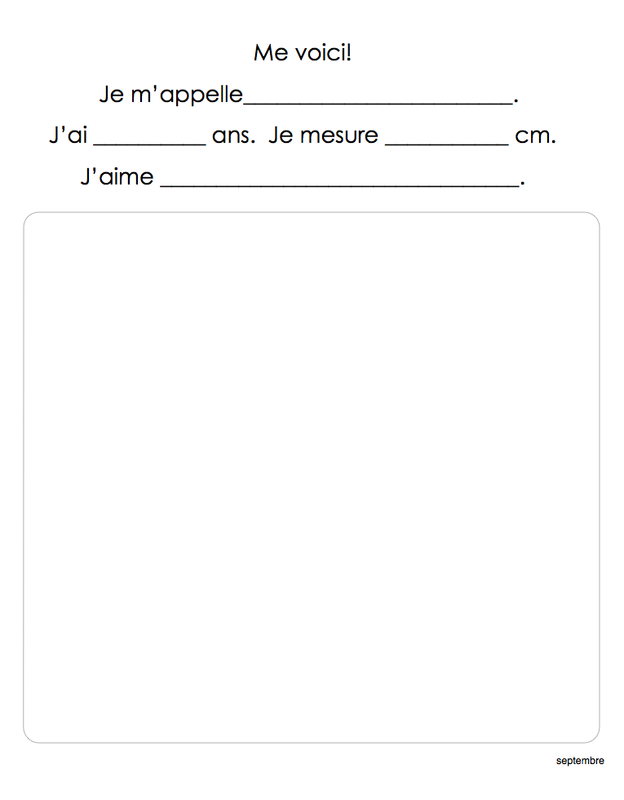 Brush up on your high school French and learn to count to at least 10. Count items as you tidy up, as you button up a shirt, as you eat a bowl of strawberries. Remember The Count from Sesame Street? Channel that guy. Oh, and once they've got that down count backwards, skip count by 2, or identify numbers out of order. Here's a little song to help you out. You can find cards to print with the numbers here. Have your child pick a number and make a set of that many (3 bey blades, legos, hair clips). You've been calling an apple une banane, your child gets to school and you realize your error? Oh well. It's ok. You won't ruin them. Your interest in their education has already communicated the message to your little learner, I love you, I support you, I'll help you, I'm interested in you and I care about your learning. If their teacher has a conniption smile sweetly and silently forgive him/her in your heart. You're doing great. 5. Get a *new* puppet who only speaks and understands French. (Kinda special, think elf on the shelf magic). We always have one in my classrooms. We've had a bunny called "Petit Lapin" and one year a puppy. The puppet can live in a fancy box or bag and to call him or her out you have to sing a little song; "Petit lapin, petit lapin, viens jouer." (Little rabbit, little rabbit, come out and play). We sing it softly, loudly, annoyingly, they love it. The puppet might want to point to things and get excited when you say the colour in French (my puppets don't talk but they react to what the children do and say). 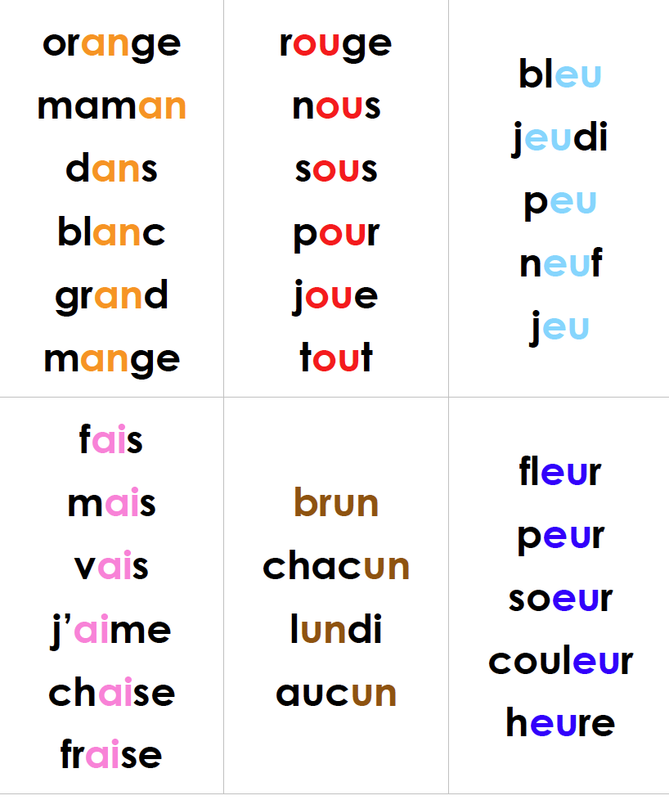 It might want to count things in your child's room or hear you sing a song and snuggle up to your child when they sing in French. 6. But I want to see them with a pencil in their hand! Okay, sure, you can go there. Just remember that even in an actual classroom writing and letters and reading happens (or should happen) in an authentic way. A special journal or book for drawing about your day is a good place to start (begin with crayons or fat pencils). Ask your child to tell you about their picture. You can scribe what they say exactly in English (I love doing this, their words and stories are priceless) and then label a handful of items on the actual picture. 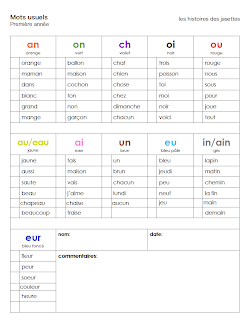 Start in English and then look some up in French. 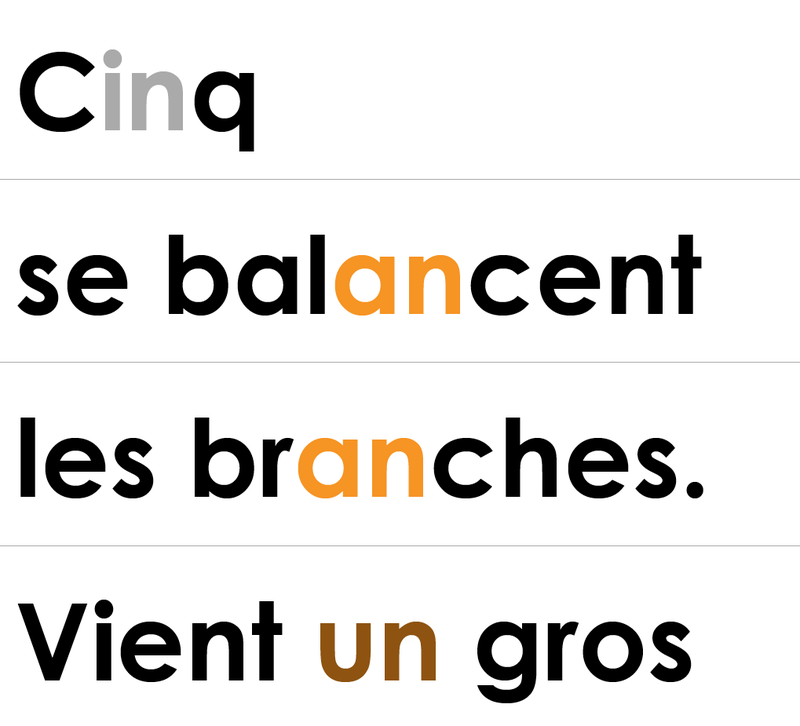 Even if you don't name anything in French you are still modeling the writing process, maybe telling a little story and forming letters. Do they want to print? Super. Write out a word with a highlighter and have them trace it (better than dots). Not ready to print? Do not worry. 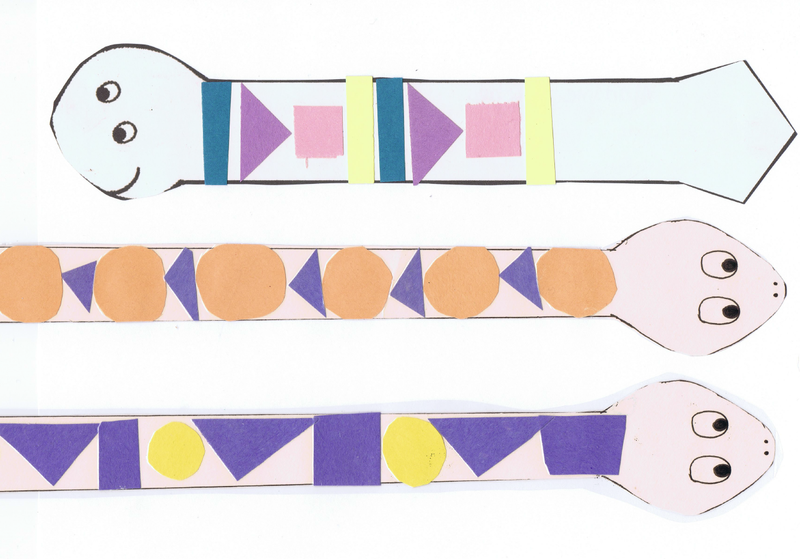 It's okay, Colour, bead, roll snakes with playdough, pick up things with tweezers and strengthen those little fingers! Your super star can already print their name and more? Awesome-sauce, give them a pencil, some letter cards or pictures of family members with their names on them. Wherever they are, go from there. Don't compare or stress or obsess (tough I know). I get to teach kindergarten and grade 1 and then often see my students again in grade 4 when I work as a guest teacher. I have seen first hand that kids speed ahead sometimes and linger in one spot at other times. They're not behind, they're lingering and will sprint ahead when they're ready. Let 'em linger. 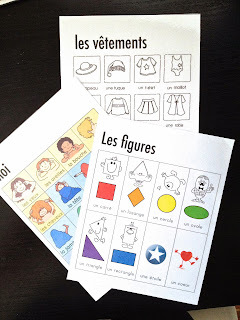 I recently came across these letters-of-the-alphabet crafts in French over at "Teaching Tricks Online". 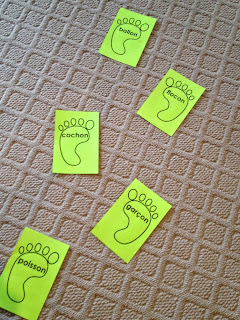 Cutting, pasting and following directions are valuable school skills as well. 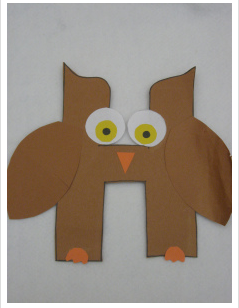 Glue each one in order into a scrapbook. 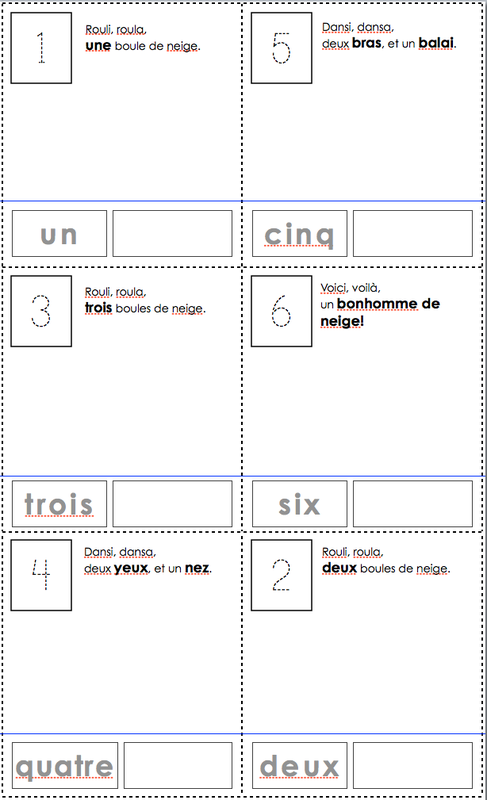 When you come across more words (French and English) that begin with a certain letter, draw or print them on the right page. Glue in photos of family members and friends and write their names too (real world language is the goal). 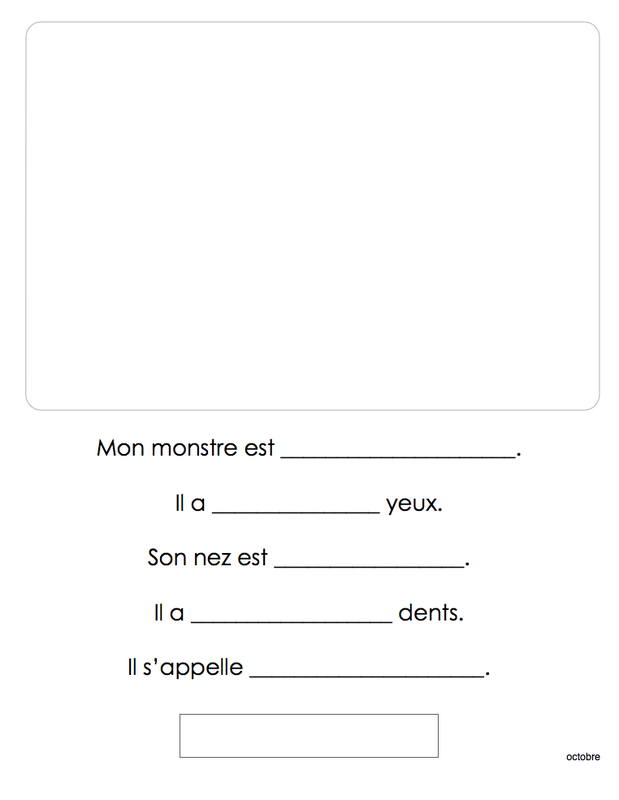 The previous links to printable words (# 2) with pictures will also have little books to make and read together. No one said you have to start with A and go in order to Z, learn the letters and sounds in their name, a friend's name, your city, keep it real. Notice I didn't say read in French. Just read. Reading is key. If children learn to associate reading with comforting, close times, quiet moments with someone who loves them they will go back to reading for those same reasons (and more) time and time again. 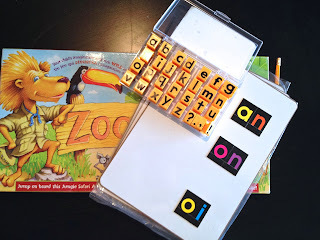 Reading teaches children to love learning, to increase their vocabulary, to begin to learn that words and books move left to right, and to begin to see that letters represent sounds and make meaning. If you need convincing check out this video celebrating International Literacy Day that Calgary Reads just put out. Brilliant. Okay, really, do they need more screen time? I know all kinds of apps and games and videos but my goal here is to have you learning and interacting with your kiddo. Even in class I keep the screen time to a minimum. Yep, there are stories and games and tricks and videos but my hope is that you'll use those minimally. Check out Sarah's Pinterest Board of French apps and books for a place to start. Sylvia Duckworth is a Canadian teacher who does a thorough job of reviewing apps for students (and she's just all around awesome), check out her blog post here. What do you think teachers and parents? 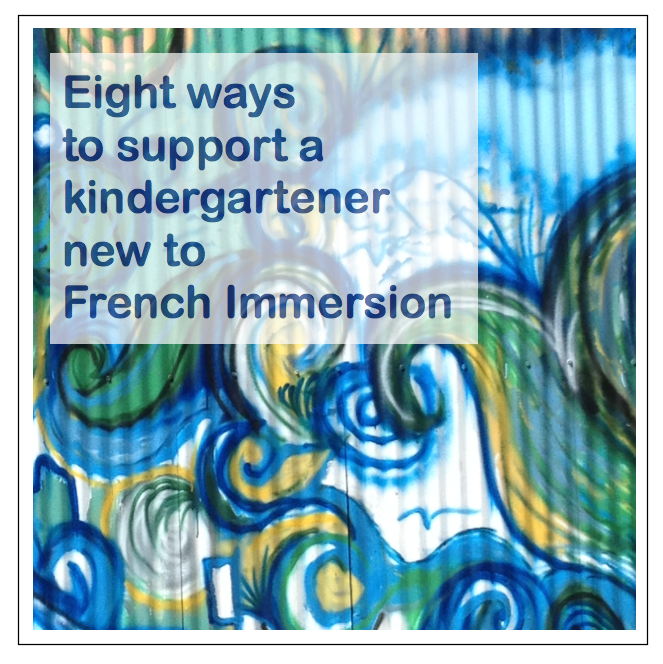 Do you have some creative and fun ways to support a kindergarten or grade 1 student new to French immersion? I haven't planned this unit and don't have all of the links to learner outcomes that I usually post. I was a guest teacher in a friend's class for a week and modified and added to many ideas of another colleague. The link to each file is provided beside the photo, click on the highlighted or underlined word to download. For a great webquest of information to get you started created by Mrs. Gebauer check out her resources here. 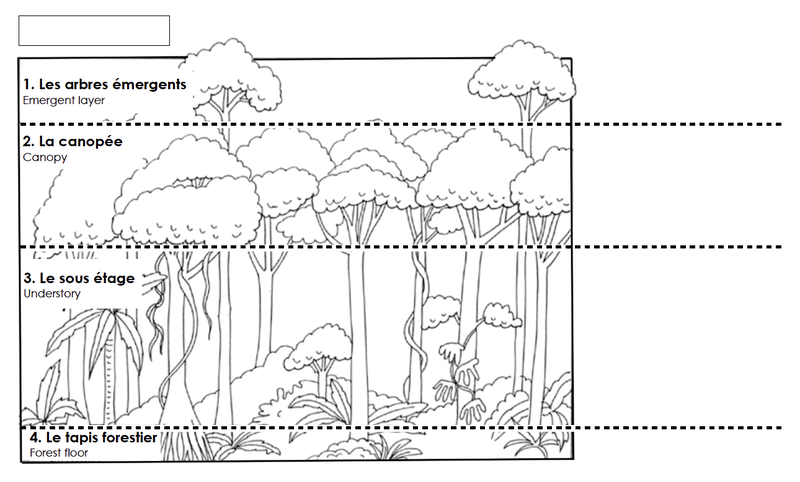 Unit vocabulary visual dictionary, photocopy back-to-back with forest layers - each student or family will have a copy of the unit vocabulary. For back of visual dictionary. 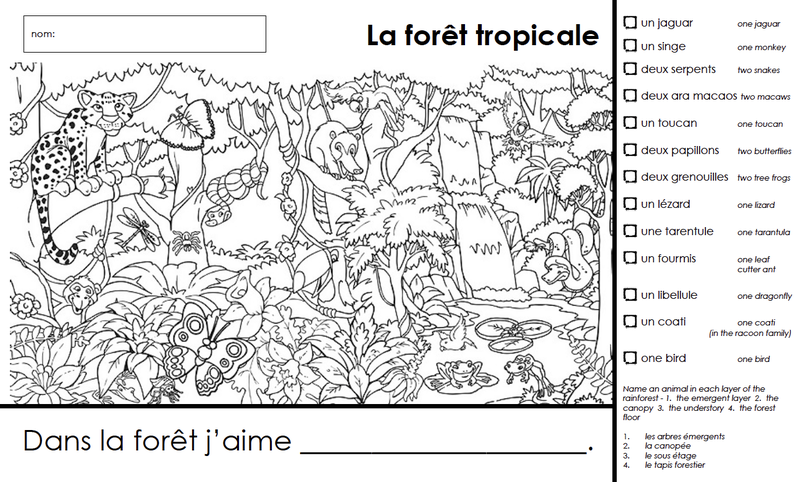 Rainforest word strips. In this document you will find word strips in colour, word strips with the images printed separately for matching and a set of black and white word strips. Word strips with images printed separately for matching. Sound blends that we know are in colour. I use the same colour for each sound blend throughout the year. 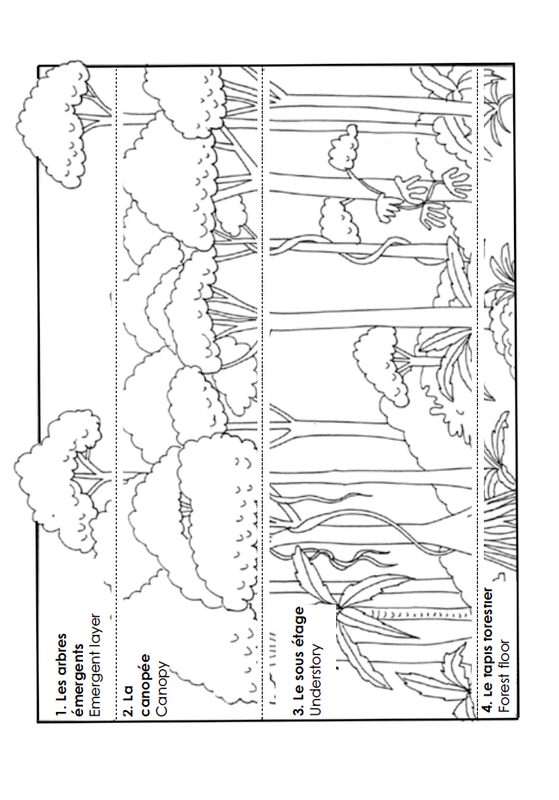 Black and white rainforest word strips. 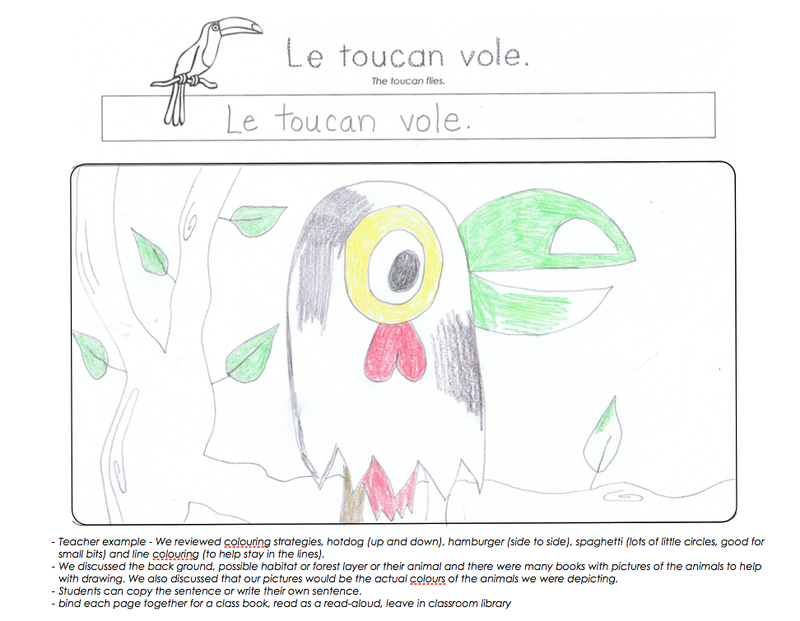 Rainforest class collaborative book. 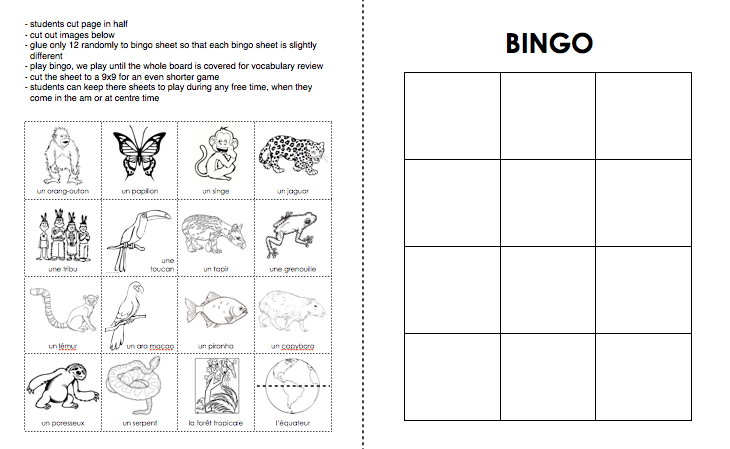 10 pages with different animals and a sentence to copy or print your own sentence. Bind together. 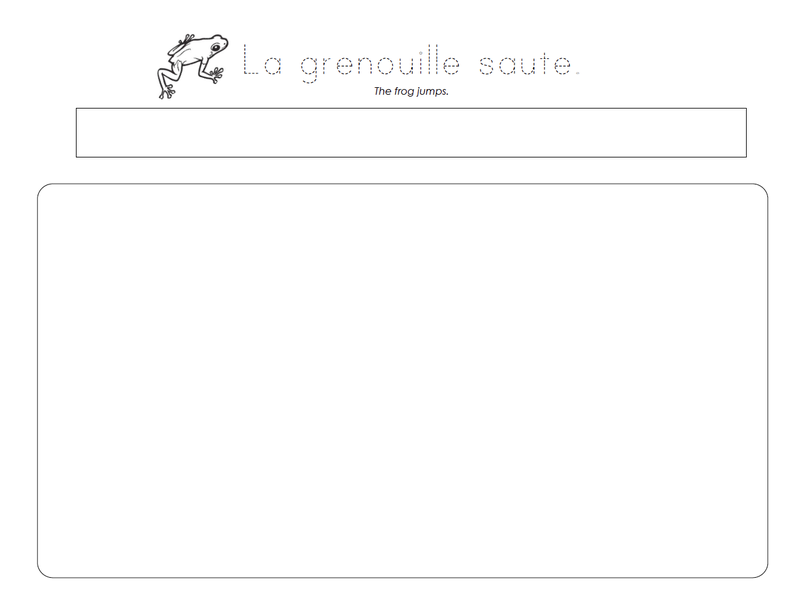 Title pages are included. These are 2 samples of about 10. Rainforest find and colour, maybe for when work is finished? To send home? We made patterned snakes and then used them as non-standard units of measurement. Thanks to Mme Astrom for this idea! 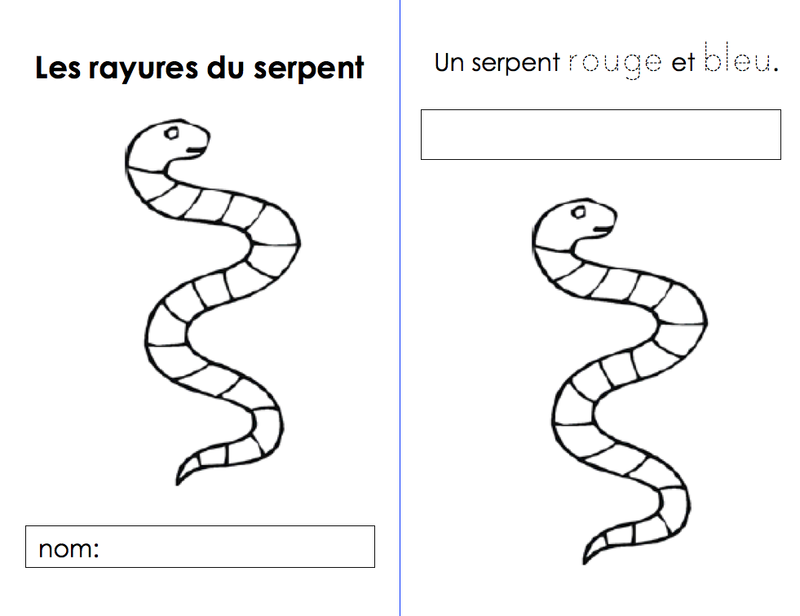 Here are my snake templates that we copied onto manilla tag. 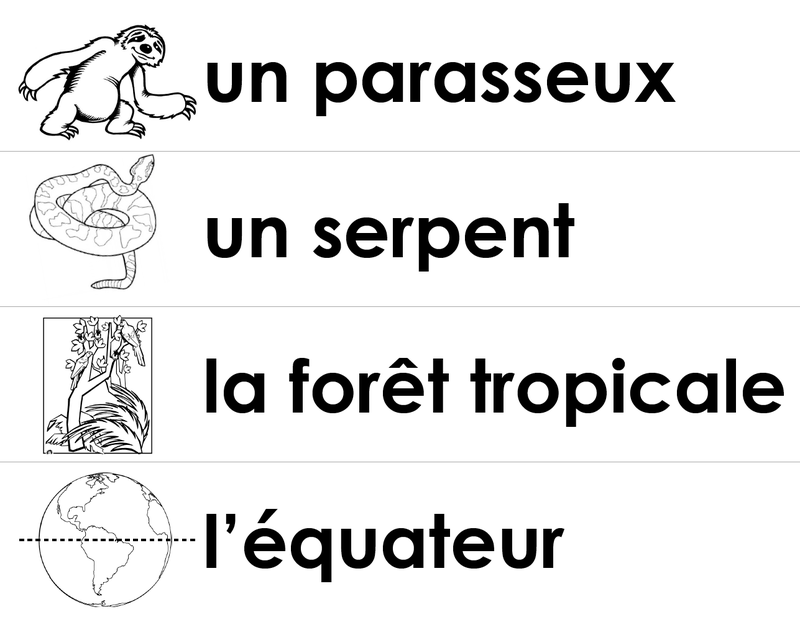 Les rayures du serpent book. Students colour the patterns and print the sentence, patterns can be ABA, ABBA. 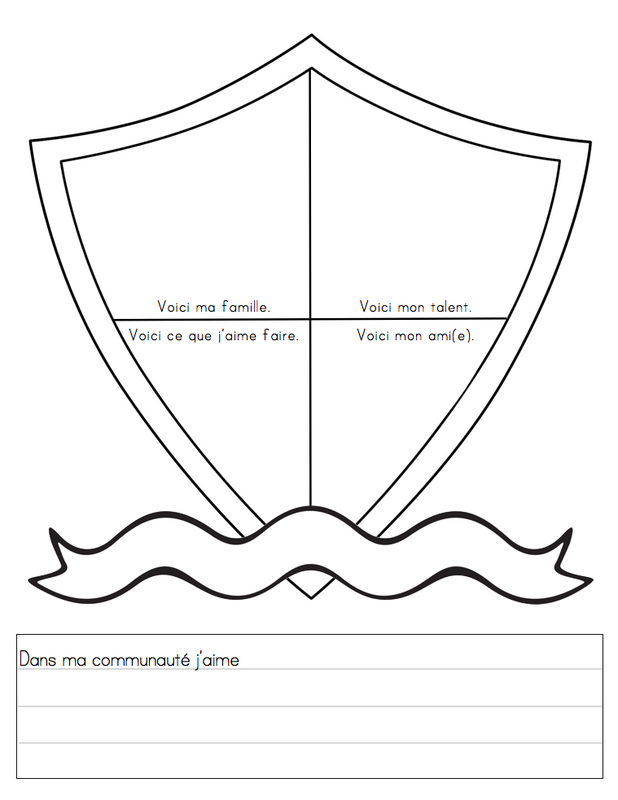 One page asks students to make their own pattern (any type) and add the colour words to the sentence. This was originally posted by Mme Astrom, I've made some changes, merci Madame. Sneaky piranhas (detailed directions are here)! 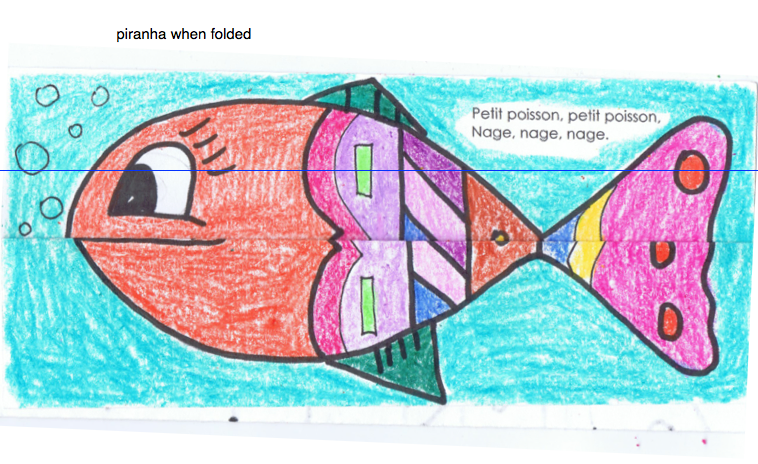 These were fun to make, especially because students already know the song "Petit poisson". We would sing the song with our piranhas closed and then open them up and yell "Ahhh, piranha!!" 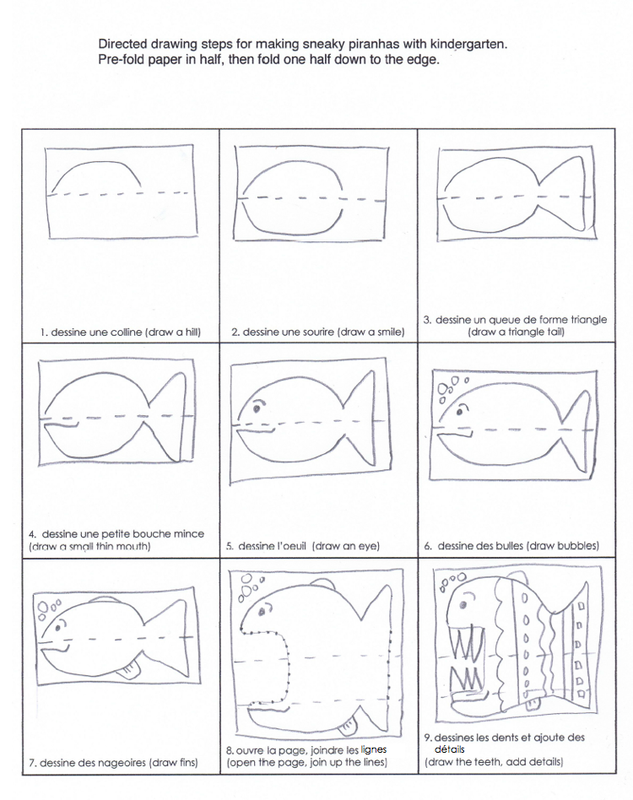 Directed drawing instructions (link is above). Five little monkeys song and puppets. Lyrics are in strips for pocket chart re-ordering. 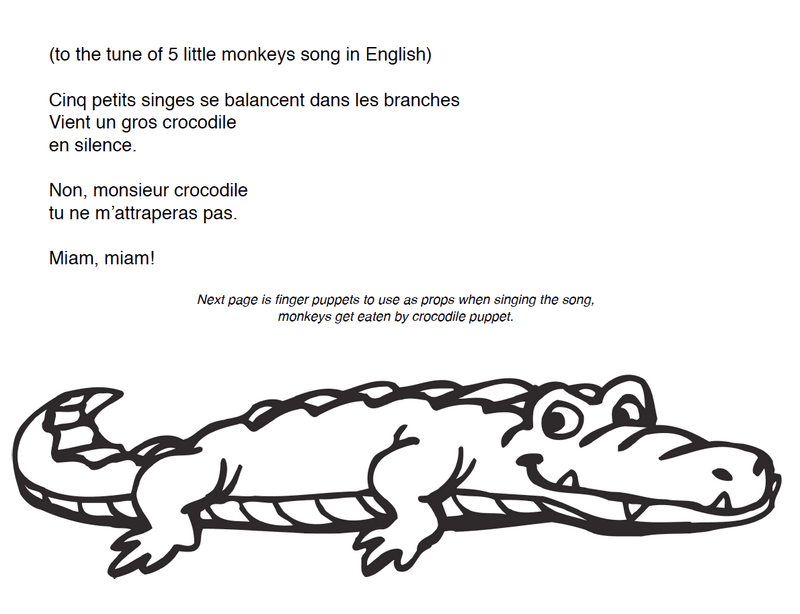 I have monkey finger puppets (tape to popsicle stick) and a crocodile puppet and students like to come up, sing the song using the monkey puppets while the teacher crocodile puppet eats them up! 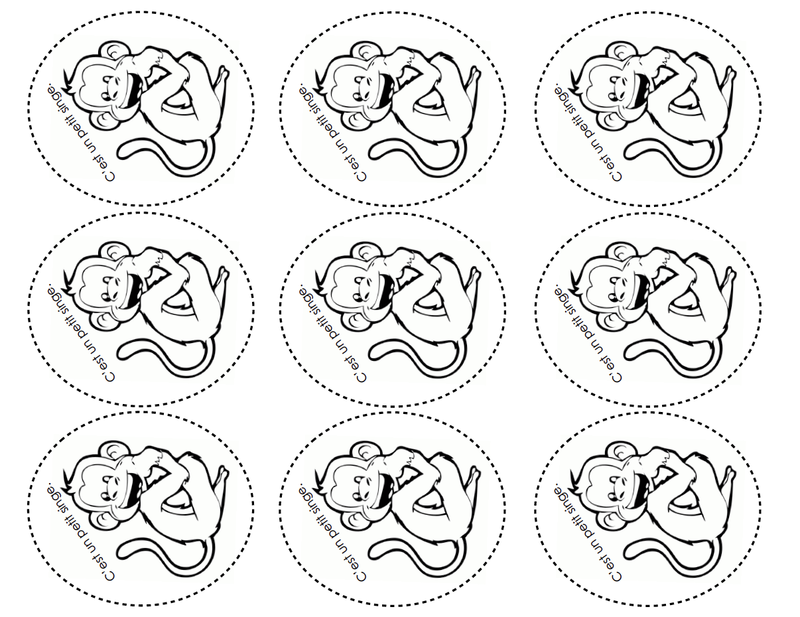 An english version of the rhyme Five Little Monkeys. Students make their own rainforest layers using construction paper (my first choice), then add the animals to each layer (the file includes animals to cut out). 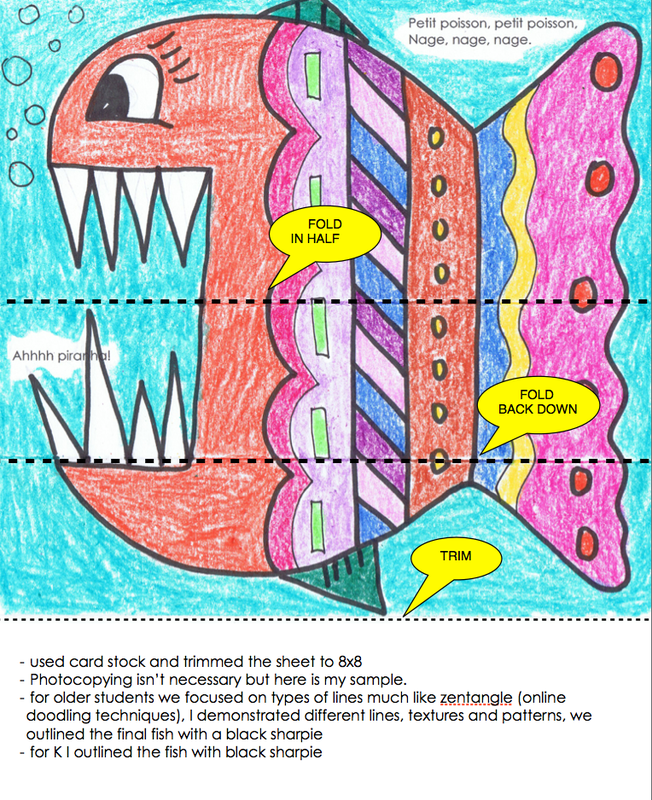 See an example on the Teacher Bits and Bobs blog here. For my group, being correct about which layer an animal spends most of their time in was less important than discussing and explaining choices. When the rainforest floods piranhas may find themselves up in the canopy rather than on the forest floor. 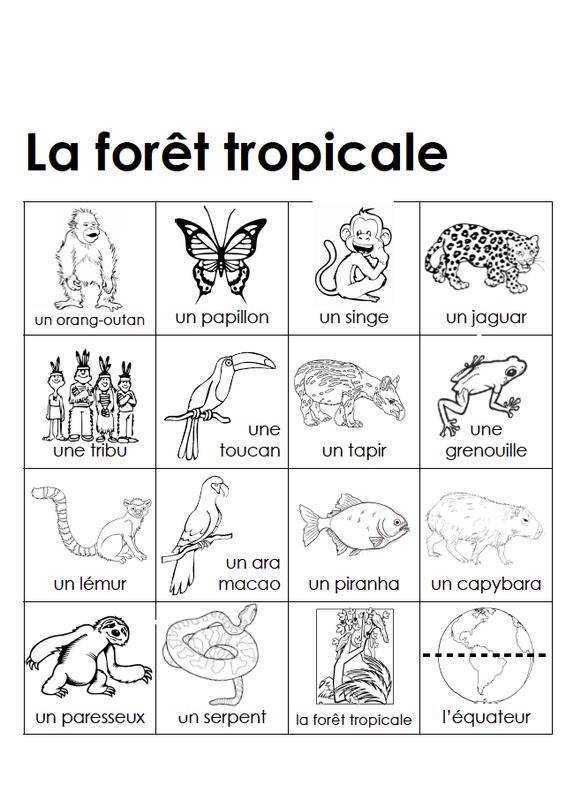 Make your own rainforest Bingo. A short animated english video about a trip to the rainforest. Two minute video narrated in English explaining the 4 layers of the rainforest. 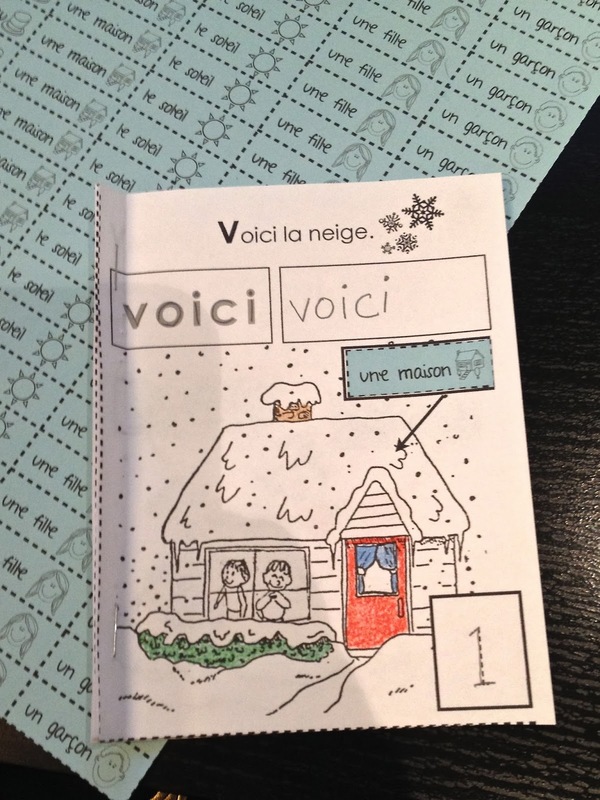 A quick booklet for a K class this week who are talking about snowmen and the letter V! 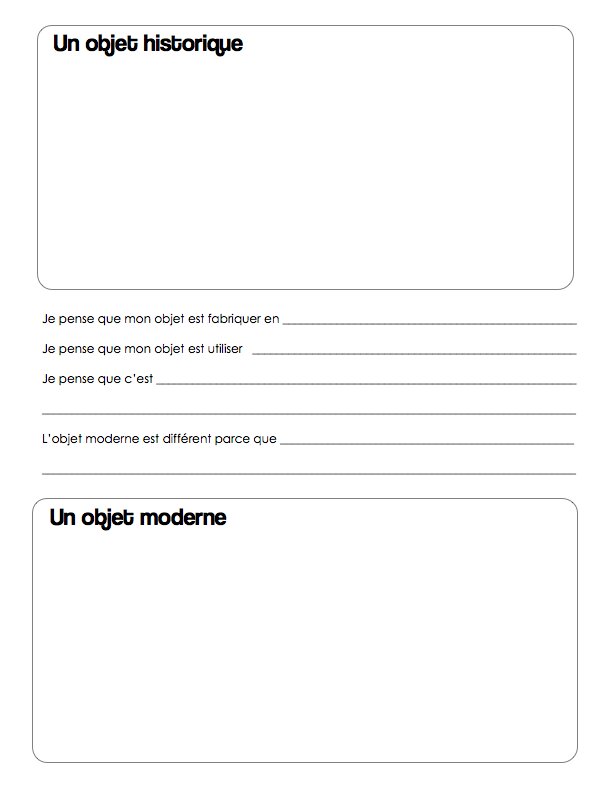 Booklet to make and read. 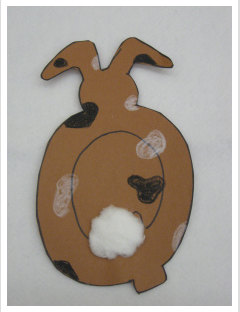 Melting snowman booklet (trace, print, match, cut, glue, read). 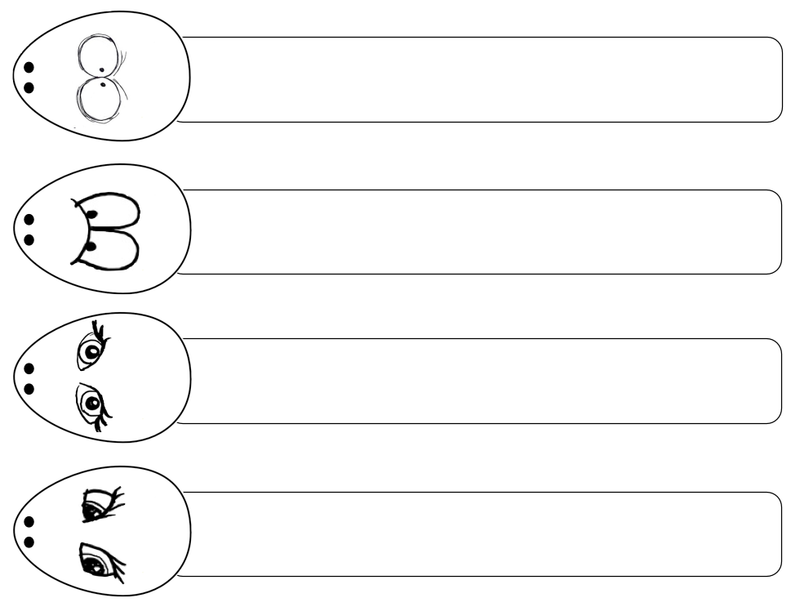 Snowman sequencing poem (trace, print, draw, sequence, read). Will post, having some difficulties. Precede with 2 videos from "Frozen". 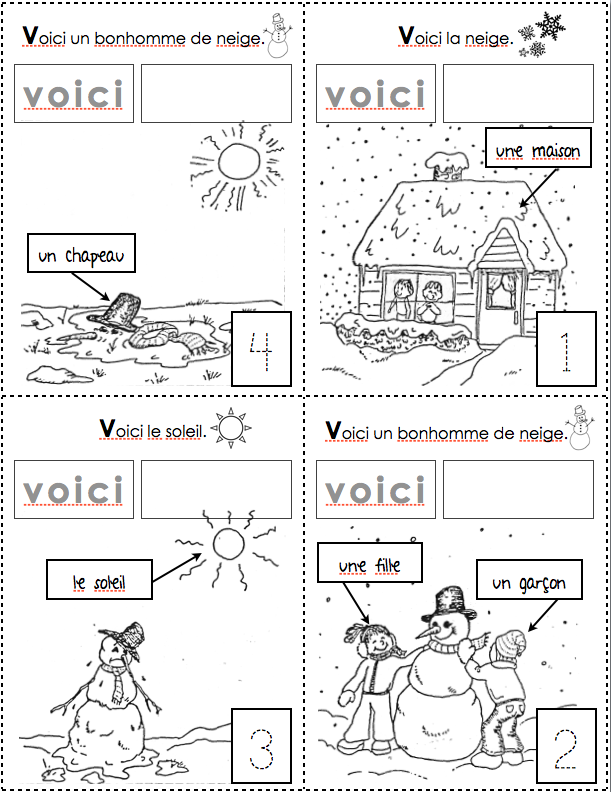 First is an introduction to Olaf the snowman (in French but very little speaking). The second is Olaf the snowman imagining what it might be like to be a snowman in summer. Aha! Comment ajouter les guillemets quand mon clavier est sur l'option «français». Voilà! SHOULD READ "OU" - MY APOLOGIES. 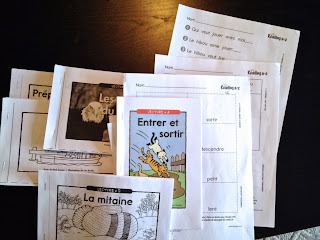 What's your routine for teaching reading and specifically French sound blends in grade 1? Here's an overview of mine. September to December we review the letter sounds from kindergarten using Jolly Phonics. Sound blends are introduced over 10 weeks beginning in January. Guided reading routines begin in March. 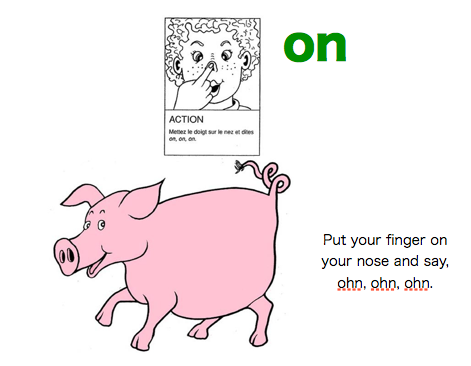 1) Introduce the letter sound and action (from Jolly Phonics). Each sound is a specific colour. In school these cards did not have English explanations. Neither did the stories as posted below. 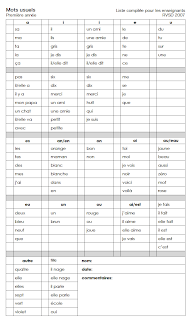 I have changed those for tutoring purposes and for families who want to help but feel lost when they don't speak French. LINK TO STORY DOWNLOAD HERE! 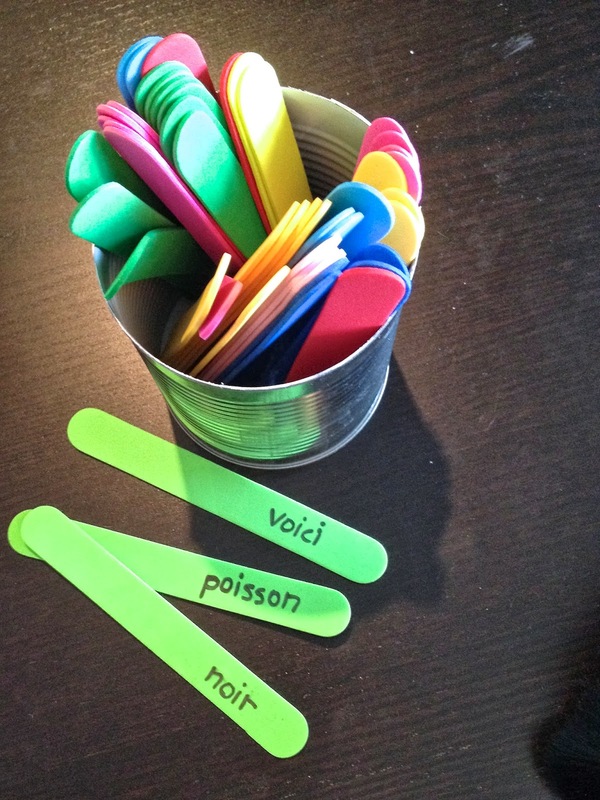 2) Circle the sound with a coloured pencil in a our words of the week. Sound out the words of the week in isolation. We look for "les petits mots", the little words in the big words. 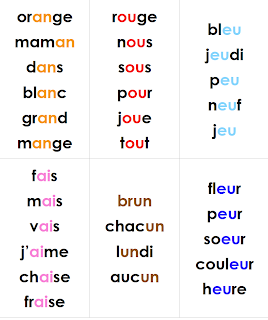 Notice "les fantômes" or "les lettres muettes" (silent words). 3) Circle the sound in our story of the week. This encourages students to look for what they know and recognize. 4) Read the story together. There are spots to spell the words and images to help as we read. 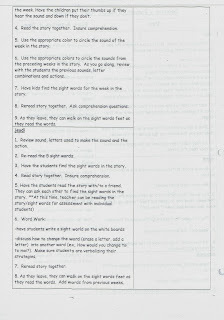 In my classroom these simple stories were on 1 sheet of paper, no booklet, and we had 3 "levels" of difficulty for various student ability. As I prepare the resources I will post the stories. 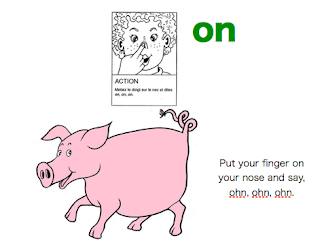 I can't post Jolly Phonics resources but they are available from their site here. 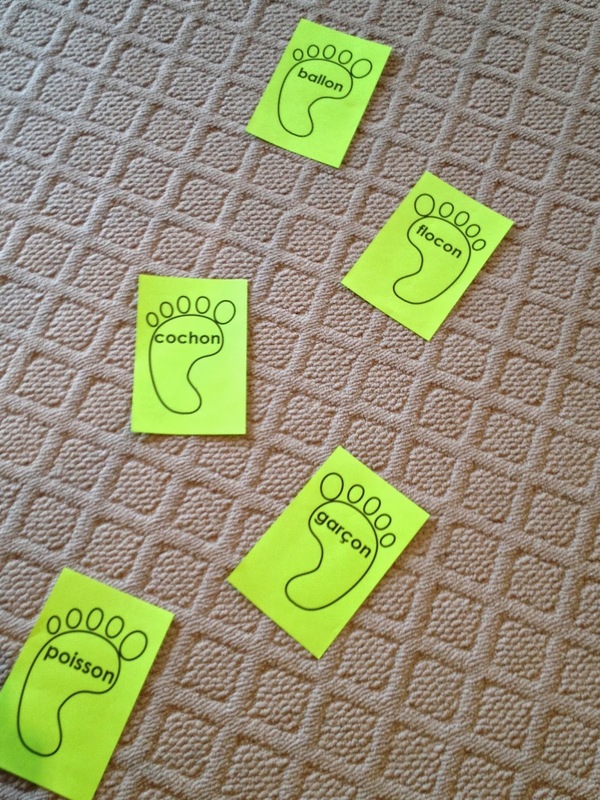 5) Play a game with the words, either walking on footprints with the words, pulling sticks from a can, making the words with magnets. We also practice listening for the sound at the beginning, middle and end of the word. 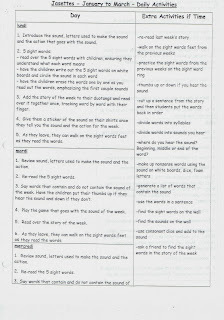 6) Change some of the words in the story to write a new story using the simple sentence structure of the story of the week. 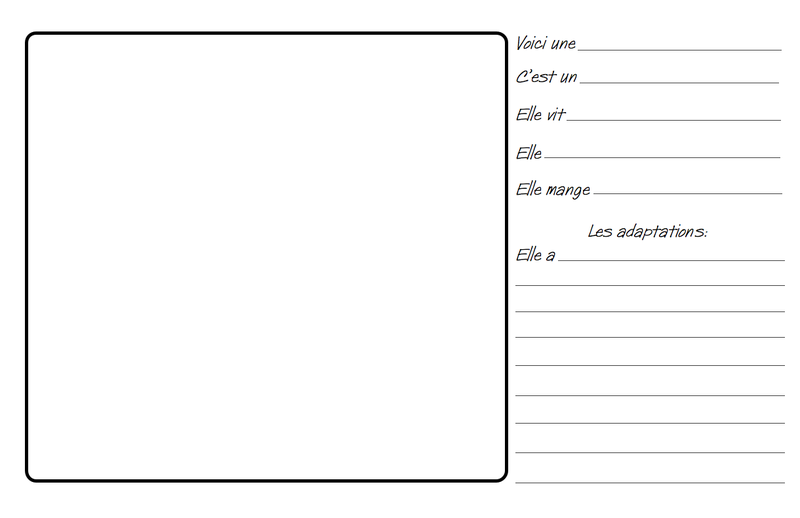 This was not part of the grade 1 routine, I've added a writing component for tutoring. 7) Use visual dictionaries to help choose new words for the new story. Usually writing your own story is for homework. 8) Stamp the sound blends on our hand (mine too), it lasts for a couple days and is a reminder of the sound of the week. 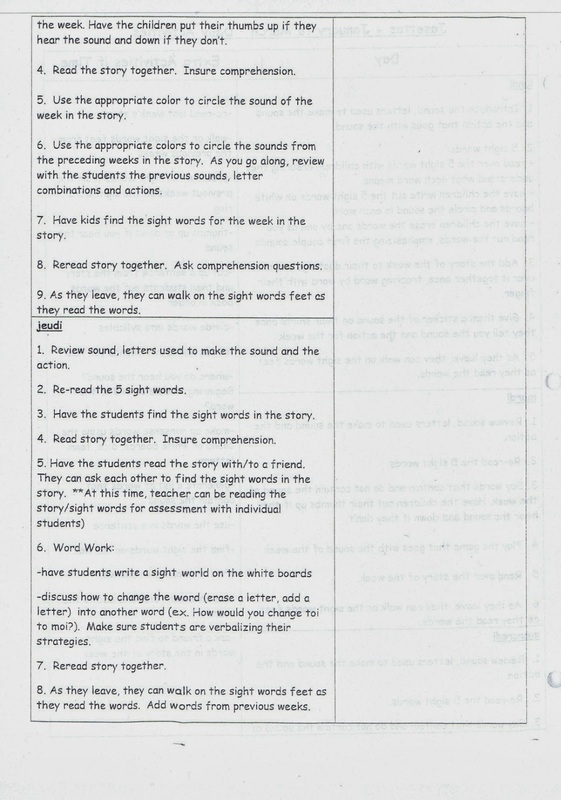 8) Practice re-reading the story, review the sound, read the word sticks, write your own story over the course of a week. Depending on where they're at practice spelling the words. In grade 1 students were to bring home their duotang, read the story and each page was stamped with a "please sign and return" note for parents. 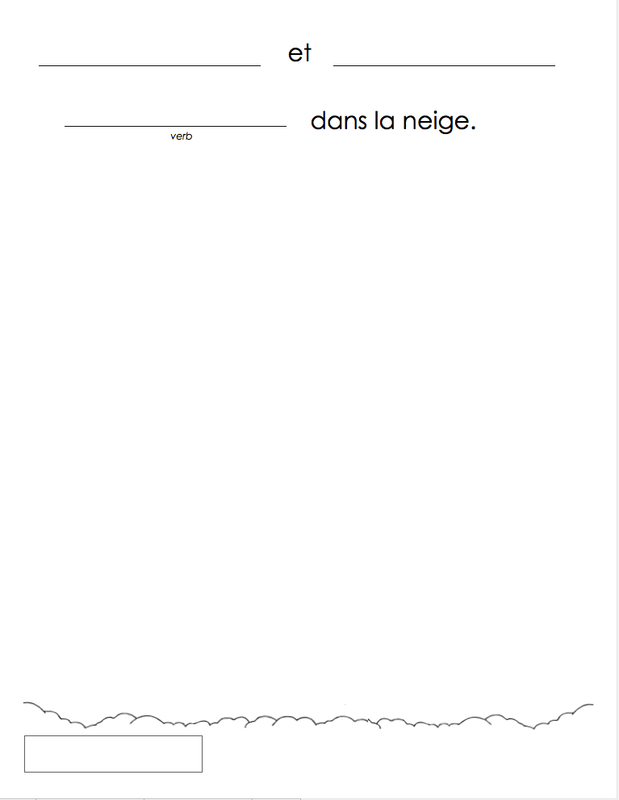 9) Each week I send something in the mail, a note, a cartoon using our words, a postcard in French. 10) The following week we review the last week's sound, reread the story, read your own story and move on to a new sound. Periodically we review past sounds, words, stories to see if it's "sticking". We can also spend time reading home reading books from school together. The first goal is reading, then spelling, then writing. This is the progression I hope to work through. 11) I have a license to print levelled books from readinga-z.com and lend these out for students to read, practice, enjoy, and sometimes do some reading response work with. 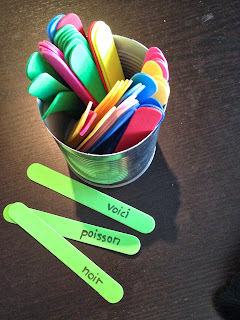 These are also the base for writing when we move on to that. 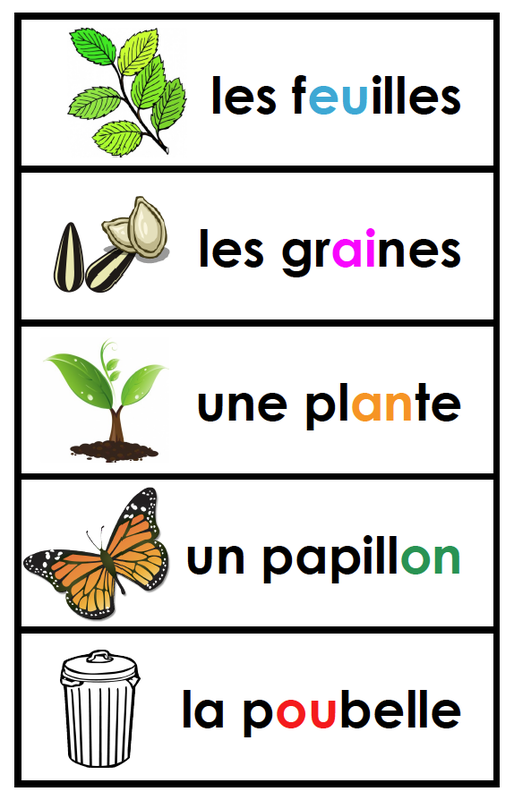 Here is the scope and sequence we used in grade 1. At the time we had a team of Francophone assistants who went to each class and worked with small groups of students. Each classroom had 4 French speaking adults for an hour block! The program can still work by teaching the mini lessons to the whole class and then working on differentiated levels of stories in small groups. We also had quick assessment check lists, each group leader did an assessment at the end of the week with each student. This gave a quick snapshot of who had mastered a sound and who needed some extra review. We had 4 grade 1 classes and kept the literacy block cohesive and structured. In January we began a guided reading routine. That's another post! 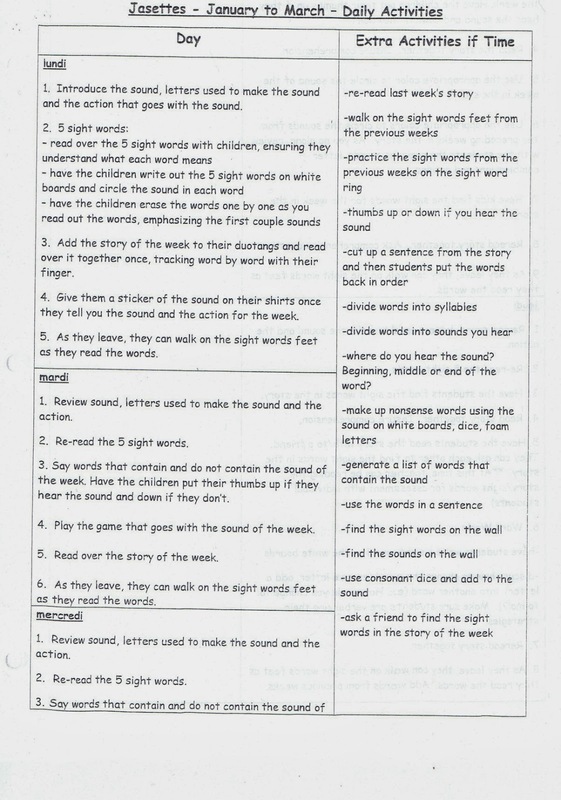 Rocky View Schools has generated a list of grade level words that students are expected to be able to read as sight words by the end of each grade. These word banks serve as part of our reading assessment. Many of the grade 1 district words are in the short stories teachers have created. 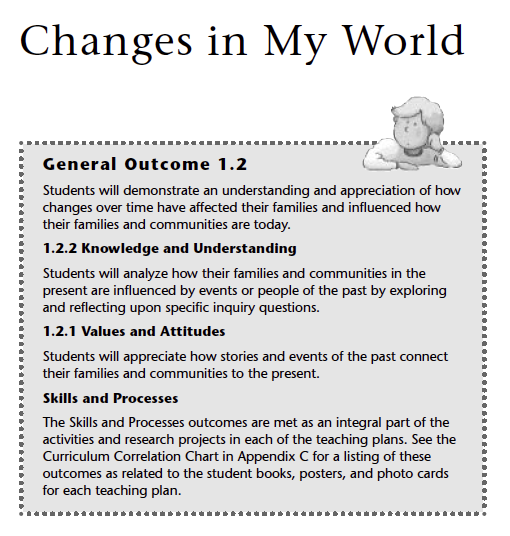 I have added support materials that include the grade 2 and 3 words for the students I work with in those grades. Everything isn't posted yet but it is comin'!